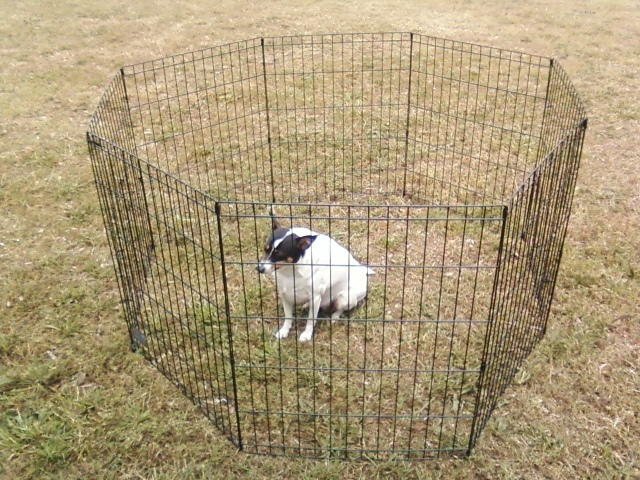 The exercise pen for the canine crew is a keeper! Remember I ordered the foldable pen made by Midwest Pets? It arrived a few days ago. Today we tried it out. It’s not too heavy or bulky. The panels are hinged together so it’s all one piece. It comes with eight stakes. Actually it’s supposed to come with eight stakes. Mine came with seven. But no matter, it’s a great item! Easy for you to say. You’re not in jail. As you can see, Bridget took to the new pen with optimism and a sense of adventure. Well, no. She had her usual response to anything new: get nervous and depressed. Spike, on the other hand, accepted the pen with aplomb. This surprised me because Spike is the one who spent a long time in a small cage at the animal shelter before I adopted him. I thought the wires might bring back bad memories. But he actually looked as if he liked it. I got the feeling he felt secure in there, like he was special (which we all know he is). Bridget, on the other hand, was adopted as a puppy so she has no memory of cages, so what the heck is HER problem? Notice the difference in expression and body language. Janie stopped by during visiting hour. Gee, guys, I’m sorry I haven’t written. It’s been hectic here on the outside. The panels can be configured to make an octagon or a rectangle. Oh this is just great. I’m going to order another pen just like this one so they can be put together. That would make a 4-foot by 10-foot rectangular pen. The height is good. Maybe we could have gotten by with the shorter panels. The 30-inch panels aren’t too high though. I can drop the crew in there easily and if I leave one of the panels unstaked, it serves as a door. Spike demonstrates for us how to use the door. Parks prefer dogs be on a leash at all times. I’ll go along with that. However, we may be camped in dispersed camping area or boondocking off by ourselves and be able to use it then .I can see us. I’ll be tinkering around the Casita, or sitting at the picnic table having lunch, or lounging in my antii-gravity chair reading my Kindle . 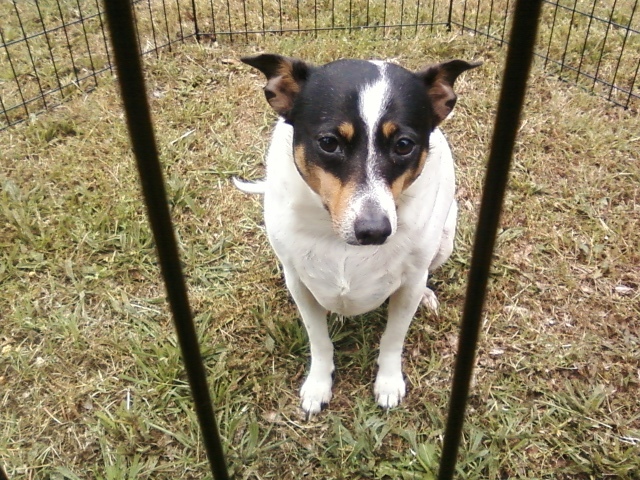 . .
And Bridget will be behind bars with Spike, trying to burn a hole in my head with her get-me-outta-here stare! 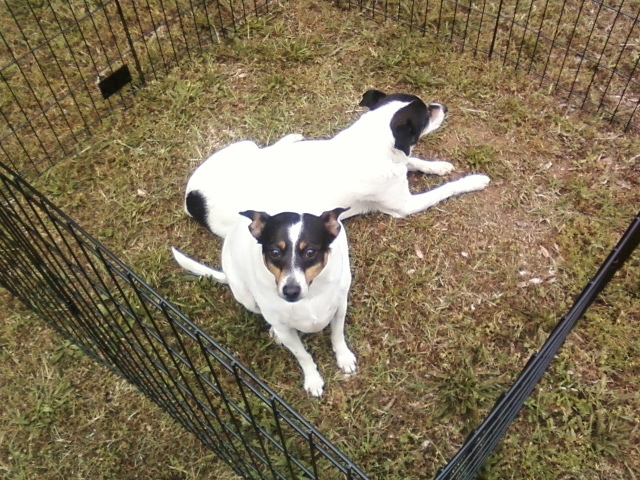 This entry was posted in Simple living and tagged camping, dog exercise pen, dogs, RVing. Bookmark the permalink. Looks like a good compromise between leashes attached to you constantly, and leaving them inside the casita alone. Dogs alone in small spaces can become frustrated….lol. Try giving the manufacturer a quick call to tell them that your first set was missing a stake, and ask what extras might cost…. chances are they’ll offer to ship you a replacement at no charge! Since you intend to boon dock from time to time, you may want to think about a non electric heat source for the Casita or a generator to protect against freezing. You’re Casita does not have a furnace and winterizing is a nuisance. I’m looking into purchasing a heater, probably one like Tioga George’s. Any chance you’ll talk about your budget for your new life? I’m 4 years away from retirement and want to start planning my adventure. You said you saved every penney you could to get ready. I’ll have to save as well and wondered what your thoughts are on how expensive or cheap you think this new life will be. I wish I had a pat answer for you! Ooh, I bet you get that often. Sorry. Really though, it’s difficult to put a dollar amount on this way of life. I don’t have any guarantee that I will be able to afford it. I’m moving on faith that I have the ability to adapt to the circumstances that come my way. In other words, I am willing to make sacrifices and do without to get along. That sounds dreary, but it isn’t for me. If I were a high maintenance person, I wouldn’t attempt this. It would fail. I’m going to rely on my frugal nature, self-control, common sense, and dogged persistence to make this work. One of the reasons I’m posting the price of my start-up purchases, and later my daily expenses on the road and fulltiming, is to provide real dollar information for people like yourself. How did I know I had saved enough to retire and do this? It had very little to do with a dollar amount. Sure, I had to have enough saved for my Casita and tow vehicle. The timing had more to do with not being able or willing to continue in my career anymore. I would have been far better off if I worked another year, but I just couldn’t do it. The feeling that I was wasting precious time kept overwhelming me. I guess the best I can say to answer your questions is… Keep reading and following my adventure and hopefully that will help you plan yours! The X-pen is great to travel with. We full-time with our Boston Terrier. Actually have 3 sections for her. That gives us enough to circle an area the size of our awning (where campgrounds permit). 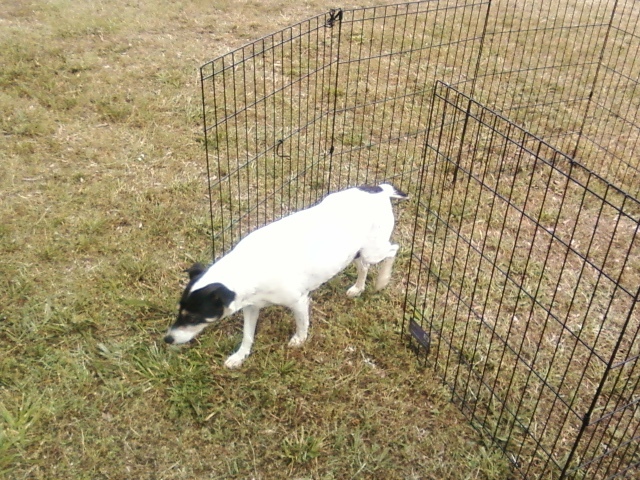 We also bought 3 ft. garden fence (snow fence) to run along the base of the RV to keep the dog fully enclosed. Thank you so much for your comment! I’ve been wondering how to make a pen where one side is the Casita. We don’t have snow fence in Georgia, of course. Doh. I’m going to look at the fake picket fence made for flower gardens. If I can find the right height it might work. They’re made of white plastic which will add that trailer park ambiance to my sitting area. I’m curious. Do you run the snow fence all around your RV so she can go under it or just along one side to complete a pen under your awning? The fencing is actually a roll of green garden fence. It is available at Home Depot and Lowes. Nice because it can be rolled up for easy storage. We run it along the I-beam on the travel trailer so the dog cannot get under the rig. We have 2 sections for more flexibility. Not able to use the entire length at all stops. We use mini clips (also at the hardware store) to attach to the beam and other section. With the green fence, it is not easily seen from afar, so it is discrete. The white picket fence would be an attractive look. Let me know if you need additional info or pictures. The dogs will love the sense of freedom. You are so good to give me all this info! I like green. It’s more subdued. Being discreet may just keep everyone happy. I love this idea! The sense of freedom is what I’m looking for. 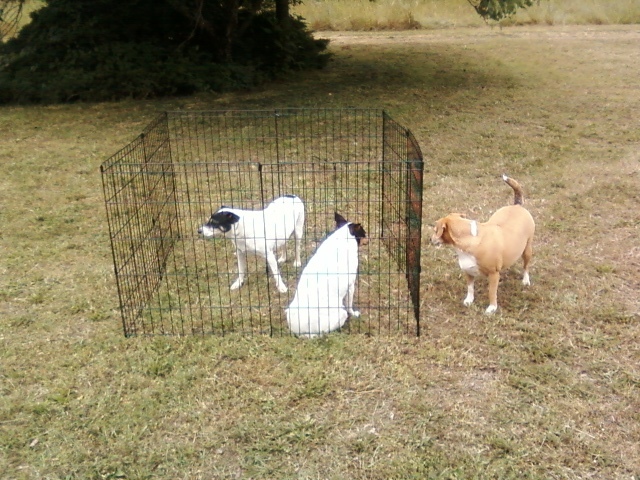 The canine crew has been spoiled having the run of the acreage at my house. It’s crazy to think you can live fulltime with two dogsand keep them on leashes every time you step out the door.